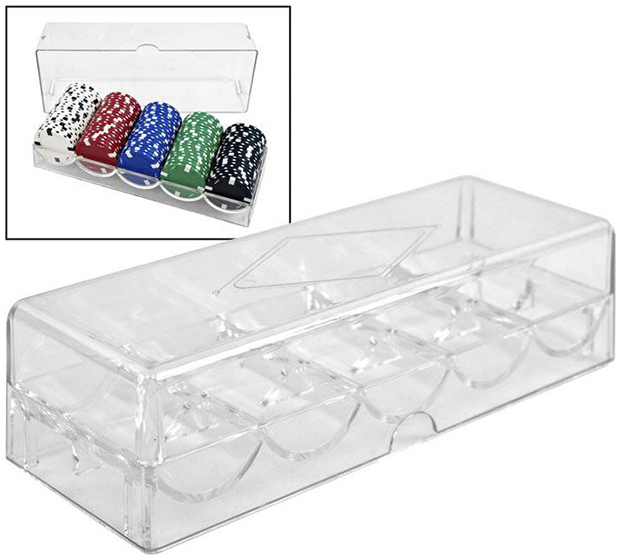 This Clear Acrylic Poker Chip Rack and Cover is great for storing or organizing 100 poker chips. The acrylic chip rack cover seals up each chip rack completely. Use it to protect your investments or chip stacks at the table from being stolen during breaks. Each chip rack cover extends to the bottom of the chip rack. These racks make for easy handling of chips. Our poker chip racks will stack one on top of the other for great storage. These trays work great alone or inside of an acrylic poker chip carrier. This rack is quality produced and used by many casinos in the country. This rack measures 8 in. (long) x 3 in. (wide) x 2.125 in. (deep).